Mathematics embodies the spirit of the liberal arts: mathematics is an art, a pure science, a language and an analytical tool for the natural and social sciences, a means of exploring philosophical questions, and a beautiful edifice that is a tribute to human creativity. Take the photo tour of the Mathematics and Statistics Department. The Department of Mathematics and Statistics offers its programs in modern classrooms and computer laboratories in the Center for Mathematics and Computing, a 42,500 square-foot building the department shares with the Department of Computer Science and the college's Information Technology Services. Students can choose between a mathematics or a statistics major. The mathematics major requires a core of Calculus, Linear Algebra, and Mathematical Structures. Students complete the major by taking six or more advanced courses beyond the core to insure both depth and breadth of mathematical knowledge. Students on the mathematics track can choose from courses such as Abstract Algebra, Real Analysis, Complex Analysis, Combinatorics or Topology, as well as many other courses offered on a regular basis. Statistics majors also take Calculus and Linear Algebra, and also courses such as Probability, Statistical Inference, and Applied Regression Analysis. Students may major in mathematics in preparation for work or further study in any of a variety of fields. In addition to traditional fields such as pure mathematics, mathematical physics, statistics, operations research and actuarial science, there are a growing number of opportunities in interdisciplinary fields, such as mathematical economics, biostatistics, biomathematics, bioinformatics, environmental engineering, and scientific visualization. Students may prepare for teaching mathematics in secondary school through a sequence of courses in the department and in the Department of Educational Studies. The statistics major prepares students for employment or graduate school. Our graduates have gone on to work for consulting firms, insurance companies and even the New York Yankees! During the senior year, majors concludes with a capstone experience, known as "comps." Students work in small groups, typically of size 2-4, on a research problem, an applied project, or directed reading. Eric Egge and Deanna Haunsperger each taught a section of Mathematical Structures. On the last day of classes, the two came together for the first ever Proof-Off, a friendly team competition to see which section could write the most and clearest proofs in seventy minutes. In addition to regular coursework, students can enhance their mathematical or statistical experience in many other ways. The department features a colloquium series at which faculty, visitors and students present topics of current or historical interest. Past speakers have included distinguished visitors such as Fred Brooks, Steven Krantz, Doris Schattschneider, Paul Erdös, Ron Graham, Carolyn Gordon, Richard Guy, Stephen Stigler, Roger Penrose, and James Propp. Students may also participate in seminars, independent study, or problem-solving groups. 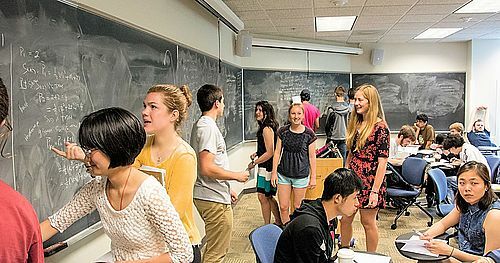 For decades Carleton has entered a team in the Putnam Mathematical Competition, a contest for undergraduates all across the United States and Canada. Often, our students have done quite well in this contest. 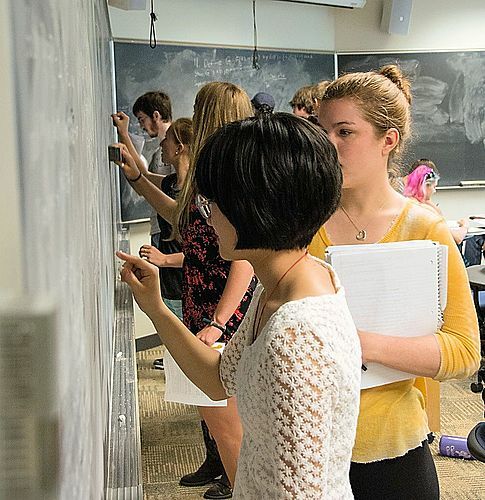 Locally, Carleton teams compete with nearby colleges in the Konhauser problem-solving contest. Carleton students also have the opportunity to do research in mathematics. The department also employs students as tutors, lab assistants, graders, teaching assistants, and research assistants. Finally, majors in the department develop close relationships with departmental faculty not only through their academic work, but also at picnics and other special events. Many Carleton mathematics and statistics students participate in summer research programs (REU's) and internships (for instance, at the Mayo Clinic in Rochester, Minnesota). In addition, many students spend a term in Hungary on the Budapest Semester in Mathematics program. Since mathematics plays such a key role in the physical, biological, and social sciences, the Calculus courses are useful to students who plan careers in these areas. Diagnostic examinations are available during New Student Week to assist students in deciding at which level they should enter the calculus sequence. The department offers a course, Calculus with Problem Solving, for those students who require extra preparation. Courses in probability and statistics are offered at several levels. For instance, Statistics: Concepts and Controversies is of special interest to students seeking quantitative literacy, and Introduction to Statistics is useful (or required) for many majors, including the social sciences, biology, environmental studies or economics. Applied Regression Analysis is a data intensive course covering modeling with multiple regression and logistic regression. Two intermediate level courses, Probability and Introduction to Statistical Inference, combine a thorough introduction to probability and statistics with data analysis and computing with R.
The department also offers First-Year (Argument and Inquiry) Seminars on an occasional basis. Topics have included Explorations in Geometry, Cryptography, and Mathematics and Art. These seminars do not have any prerequisites. Russ PetrickaMath Skills Center Director Russ Petricka with student. Stats Lab: CMC 201Jenny Grover ('06) working on her senior comps project. Math Skills CenterJonah Ostroff ('08) working on a homework problem. Paper ConstructionA paper construction in the Math Skills Center. Goodsell Observatory is in the background. Math Skills CenterStudents working on their mathematics homework. Professor Appleyard giving his last lecture.